My weekly skin care regime, pamper my skin with Facial Mask! Trying out My Scheming Mask 我的心機 facial mask for the first time! 5 Piece Special Edition Pack! Look at the pretty packaging of each mask! I’m so tempted to try all at one time! And my pick for this week! Bird’s Nest Collagen Hydrating Mask! Bird’s Nest has been regarded as rare material for skin beauty, which contain natural proteins and minerals. Collagen is able to enhance skin moisture, brighten skin and give you a red glow face. The mask which contains bird nest and collagen provide skin double moisture and keeps sheen and lightness and elasticity on your face. Its advanced moisture factor prevents skin from dryness, coarseness and aging to improve and renew skin and enhance metabolism. It has good effects on reinforcing skin elasticity and prevent wrinkles and lines. Going to try it now! Super Hydrating & Nutritious from the Bird’s Nest Collagen! Love the thin sheet of mask! Made of 100% Japan Pulp + Pearl Paper! Fit my skin perfectly and my skin able to absorb essences from the mask promptly! Removed it after 20 mins and my skin feels so bouncy and hydrating!! Can’t wait to try out the other type of masks next week!!! The 5 Piece Special Edition Pack Selling at $8.50 only!! Hurry grab a few boxes at Watson Stores! Perfect Gifts for your friends this Christmas! 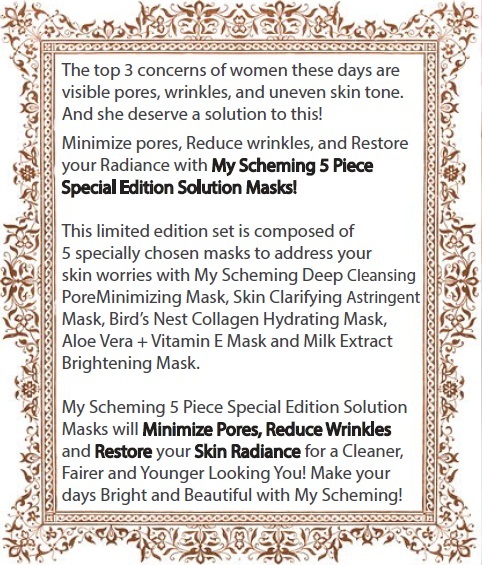 Start pampering your skin with My Scheming (我的心機) masks and prepare for Festive Celebration! 2012 Christmas Giveaway! Merry Christmas! !